Three months after President Donald Trump’s historic handshake with Kim Jong Un, the North Korean leader is holding up talks over one consequential demand: a declaration ending the Korean War. For Trump, the request presents a dilemma. Granting it could guarantee himself another headline-grabbing moment to play the peacemaker weeks before a pivotal midterm election. Withholding it could give the U.S. a second chance to win real concessions in its goal of eliminating the regime’s nuclear threat. 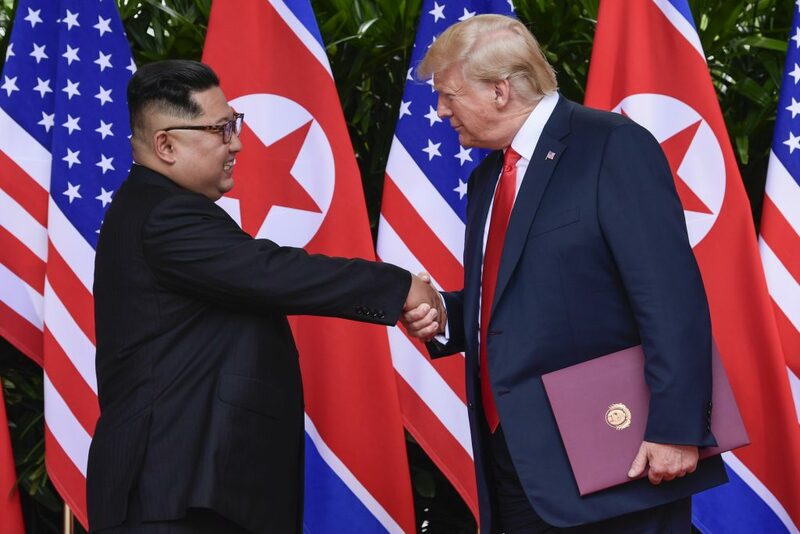 Either way, the prospect of a peace declaration to end the 70-year conflict is one of the biggest pieces of leverage Trump has left in dealing with Kim without going back to “fire and fury” threats of nuclear war. The stakes are high: Any peace declaration will bolster arguments for easing sanctions and scaling back the American military presence in South Korea. In exchange for declaring peace on the Korean Peninsula, President Trump could insist that Kim provide firmer disarmament commitments, such as allowing inspectors to scrutinize his nuclear arsenal or setting a time frame for giving it up. Or he could settle for a more open-ended pledge that gives the North Korean leader more room to stall. On Monday, the Trump administration sent signals in both directions. Even as national security adviser John Bolton said the U.S. was “still waiting” for North Korea to take steps to denuclearize, the White House said it was ready to start planning a second summit to follow up on Trump’s historic June meeting with Kim in Singapore. In subsequent weeks, the U.S. and North Korea have clashed over the pace and sequence of meeting those goals. North Korea denounced the U.S.’s “unilateral and gangster-like demand for denuclearization” after Secretary of State Michael Pompeo pressed for more specific commitments during a July trip to Pyongyang. Trump canceled a follow-up visit by Pompeo last month, citing a lack of sufficient progress. Last week, Kim told a visiting South Korean delegation that he was frustrated by what he said was a lack of recognition over his decision to suspend weapons tests and dismantle a key testing site. He said he wanted to “achieve denuclearization” before Trump’s term ended in early 2021 and offered a specific demand: a peace declaration. Such a declaration would represent a symbolic first step to replacing the armistice that ended the Korean War with a formal peace treaty — a process that could require years of negotiations. That 1953 cease-fire was signed by the military commanders of China, North Korea and the U.S.-led United Nations forces, but not South Korea, which boycotted talks. A peace declaration could also increase pressure on the U.S. to relax international sanctions on North Korea, something China and Russia have advocated. “The trickier task will be for the Trump administration to manage domestic and global perceptions, interpretations and political implications,” said Duyeon Kim, an adjunct senior fellow at the Center for a New American Security in Seoul. “Ending” the Korean War would provide Trump a signature accomplishment to tout while campaigning to preserve Republican majorities in the U.S. House and Senate in the November midterms. In a rally in Montana last week, President Trump highlighted Kim’s suggestion that he wants to denuclearize during his tenure. Moon Chung-in, an adviser to South Korea’s president, told the local MBC News on Sept. 5 that the U.S. might grant a peace declaration in exchange for a complete list of North Korea’s nuclear facilities, material, weaponry and ballistic missiles. “That’s enough to discuss a deal on declaring the end of war,” he said. Still, Duyeon Kim, of the Center for a New American Security, said that even a symbolic declaration would still need language to protect the U.S.’s military position on the peninsula. “There would need to be a crystal clear agreement with Pyongyang, Beijing and Moscow that a war-ending declaration does not alter the armistice in any way, shape or form and contains no ambiguity for international lawyers to argue various interpretations,” she said.